Hiring a professional for home remodeling work can be a frustrating process for a homeowner. Most likely, you infrequently deal with large scale home repair and build contracts. Yet the contractor you are working with might issue contracts several times a week. With this kind of disparity of experience, it is easy to feel like the deck is stacked against you. But you can gain confidence in the process by learning the basics of the bid (or fixed-price) vs. estimate (or time and materials) contract systems. A bid style proposal is one in which the contractor views the situation, assesses the amount of work and materials that are needed, then offers you a single price for the work. This is also called a fixed-price or all-inclusive pricing proposal. Small projects nearly always come with a bid-style proposal. The occasional one-off repair or small remodel project such as water heater installation, dishwasher repair, or even floor installation have so few working parts that it is easy for the contractor to predict the cost. Most contractors will add a hidden contingency fee in the bid. Known only to the contractor, the amount of this contingency represents a type of gamble on the contractor’s part. The contractor uses this as a buffer against minor adverse changes that might affect the contractor’s profit margin. One example would be an interior painter working under a bid proposal basis who realizes that he miscalculated the amount of paint needed by a couple of gallons. Instead of charging the homeowner for the extra cans, he purchases them and takes them out of his contingency. This contingency represents a normal, even necessary, part of doing business as a contractor. If the contingency is not used, this essentially represents additional profit for the contractor. This is not to say that fixed-priced proposals are opaque. You still do have the opportunity to see and make choices about materials. All materials, including quantities, will be itemized and described in a broad sense. Bid-based proposals guarantee a specific job for a specific price, making the process simple and giving you greater peace of mind. If the project costs increase, the contractor will, to some degree, absorb them with the contingency. This is why the bid is sometimes referred to as an all-inclusive bid. The homeowner is not accepting the risk for minor exclusionary items. Knowing that project costs are far less prone to spiraling out of control, you can better develop your budget. Bid proposals are the most common and thus may be the most comfortable type of proposal for many homeowners. Only a reasonable amount of unexpected costs can be covered by the contingency. For example, a contractor who issues you a fixed-price bid for laying engineered wood flooring cannot be expected to repair floor joists if it is discovered that they are in poor condition. The contractor will either do this as a separate project via a change order or you have the option to hire another person to do the work. A contractor may be motivated to purchase the least expensive possible materials and hire the least expensive sub-contractors. While cheap does not always translate to lower quality, it often does. In fact, the term contractor-grade (or builder-grade) is widely used to refer to minimally acceptable, inexpensive building materials. Bid proposals make it harder to compare between different contractors because items may be listed differently. In an estimate-style proposal, every item that comprises the project is listed in painstaking detail. You are billed for the materials used, actual hours worked, and work performed by subcontractors. The contractor’s fee is expressed in the form of a percentage of the project cost. This type of contract is also called a time-material or cost-plus contract. These contracts are the most transparent type, but they can also be voluminous, since they may list hundreds of different line items. Nothing will be left out, even peripherals such as portable toilets, roll-off dumpsters, permits, and debris pickup. Estimate proposals are characteristic of larger scale projects such additions or home building. In fact, due to the complexity of these projects, it would be nearly impossible to issue a fixed-price proposal. 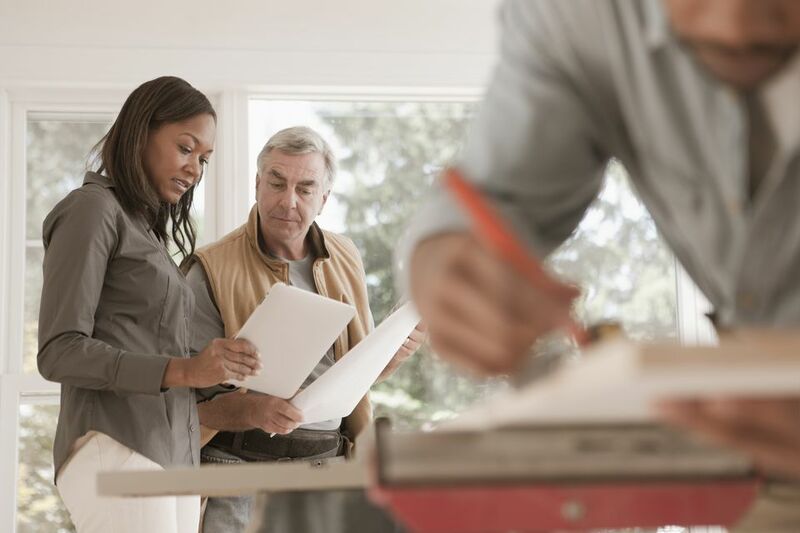 When assessing your recommended three estimates from contractors, these types of contracts can be easier to compare, since items should match up, one for one. As the homeowner, you may prefer billing only for time and materials because it should conform better to the actual amount of work done. If you like having closer control over a project, this type of contract is best for you. While the contractor might shop around for lower-priced materials and sub-contractors, his incentive for doing so is lessened. As an example, the contractor may choose a higher-priced subcontractor over a lower priced one simply because he likes working with one over the other. Are you fine with managing risk? This type of contract is best for homeowners who are less cautious of risk, but who also like the prospect of saving a bit more money. Because the contractor’s fee is factored from the project cost, the contractor stands to make more money from higher project costs.